 Suzanne Scholsberg. Brown Daily Herald. 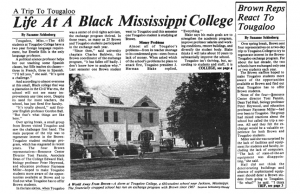 “A Trip to Tougaloo: Life At A Black Mississippi College”. BDH Digital Archive. April 2nd, 1986.